FILE - In this undated file photo released by a militant website, which has been verified and is consistent with other AP reporting, militants of the Islamic State group hold up their weapons and wave flags on their vehicles in a convoy on a road in Raqqa, Syria. An airstrike hit militants and civilians trying to flee the last area controlled by the Islamic State group in eastern Syria on Friday, killing at least 20, the country's state media and opposition activists reported. The airstrike on the IS-held village of Baghouz comes as the offensive against the extremists by U.S.-backed fighters of the Kurdish-led Syrian Democratic Forces has intensified over the past few weeks. It also comes as the United States begins the process of withdrawal from Syria. 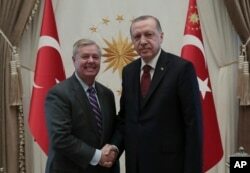 Meanwhile in Turkey, President Recep Tayyip Erdogan met with U.S. Republican Senator Lindsey Graham to discuss the situation in Syria as the U.S. begins the withdrawal process. Turkey's President Recep Tayyip Erdogan, right, and U.S. Republican Senator Lindsey Graham shake hands before a meeting in Ankara, Turkey, Jan. 18, 2019. 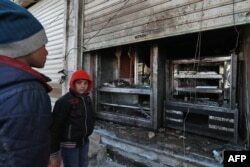 FILE - Syrian boys look at the destroyed grills outside a shuttered restaurant that was the site of a suicide attack targeting U.S.-led coalition forces in Manbij, Syria, the previous day, on Jan. 17, 2019. Islamic State claimed responsibility for the attack. In northwest Syria, the observatory also said an explosion outside an office belonging to an al-Qaida-linked group killed another 11 people Friday, including seven members of the militant group Hayat Tahrir al-Sham, or Levant Liberation Committee. Smart news agency, an activist collective, said 12 people were killed, many of them militants.